Just a styling variation of the original TI-30 STAT. For a short time the TI-30 STAT featured yellow keys, don't miss the TI-30 STAT (1988). 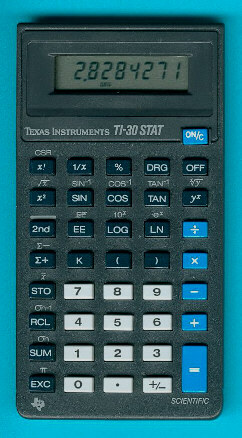 It took another year before the TI-30 STAT (1990) appeared with a mixed design of blue and yellow elements. Recently we discovered a TI-30 STAT manufactured in 1992 with a different texture of the housing but an identical design. To make the TI-30 STAT series a little more confusing, don't miss this one: TI-30 STAT (??). An overview of the seven different versions known today could be found here.